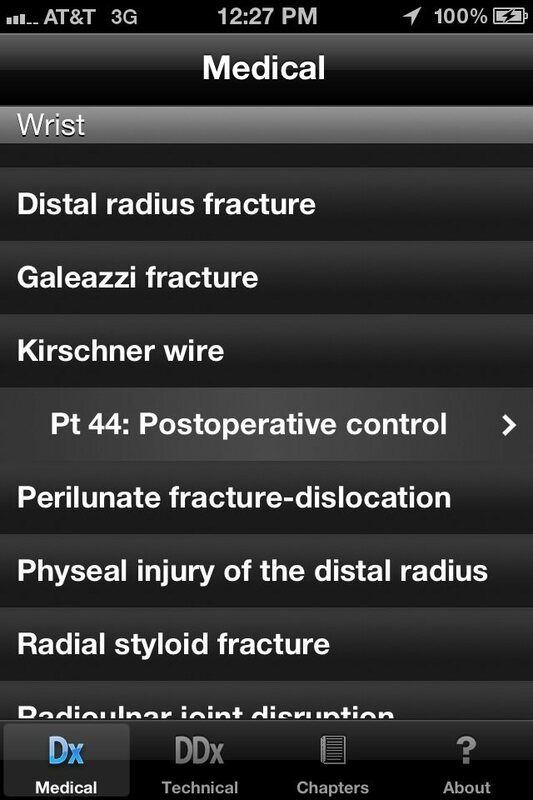 RealWorld Orthopaedics, while not sufficiently comprehensive or well-organized to act as a standalone reference, is a handy tool for learning how to read orthopaedic plain radiographs. The app contains x-rays of mostly orthopaedic trauma cases, with explanations of radiographic findings and relevant clinical information. The ideal target audience would be medical students and residents in orthopaedic surgery, radiology and emergency medicine. 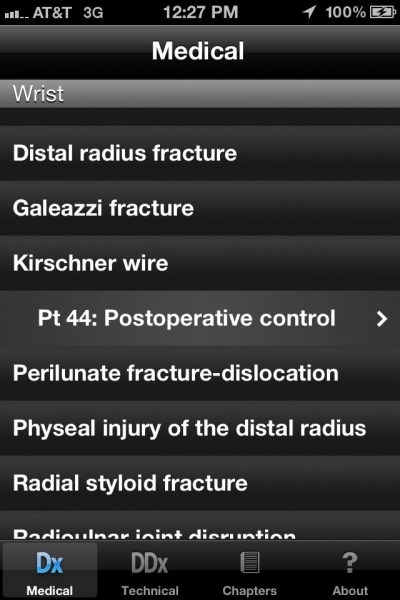 This app was produced by Hyperexis and designed by Christian Iorio-Morin, with the University of Sherbrooke in Quebec. It’s available in English and French for the iPhone 3GS or later, iPad, iPod touch 3rd generation or later, running iOS 4.2 or later. The iPhone and iPad versions are the same in content, with minimal variations in format. 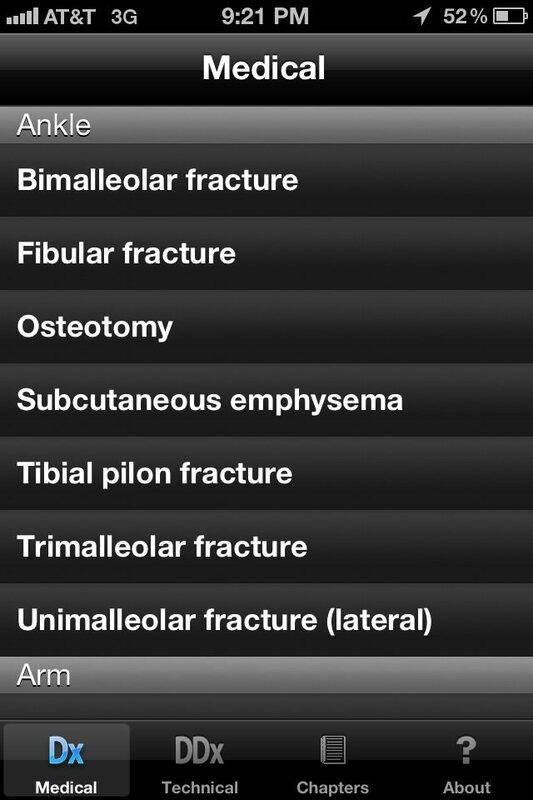 After a quick splash screen, the iPhone app opens to a list of diagnoses, sorted by anatomic location. The iPad version, on the other hand, opens to the About the app/developers screen, and requires the user to click on “Atlas” on top to reach the same screen as the iPhone startup. Check out the iPad review here. 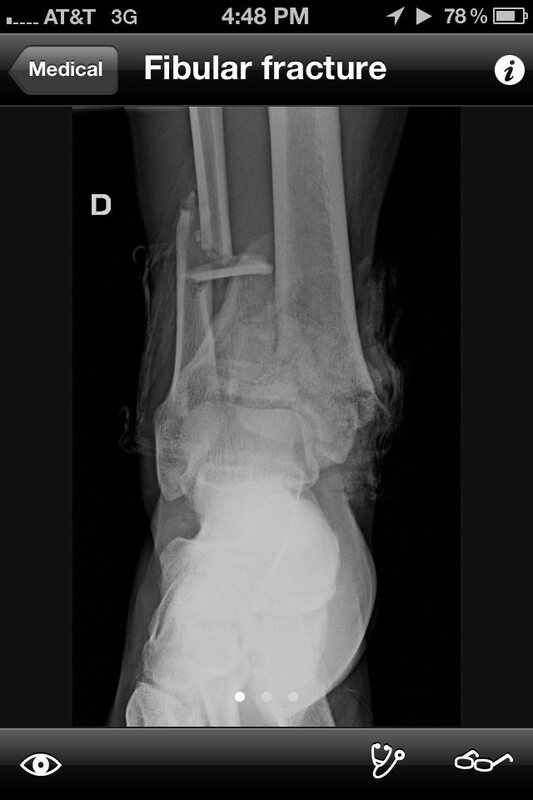 OK, sure, this patient does technically have a fibular fracture, but could you imagine having an open pilon come in and telling your attending you have a 37 year old male with a fibular fracture? 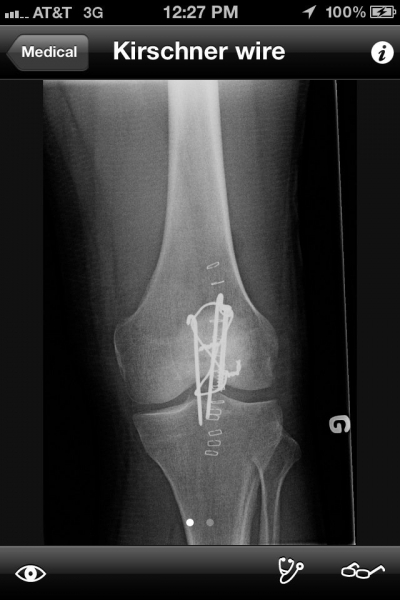 This example was particularly puzzling, when you realize that they have a perfectly reasonable isolated lateral malleolus fracture case that could have been used instead. 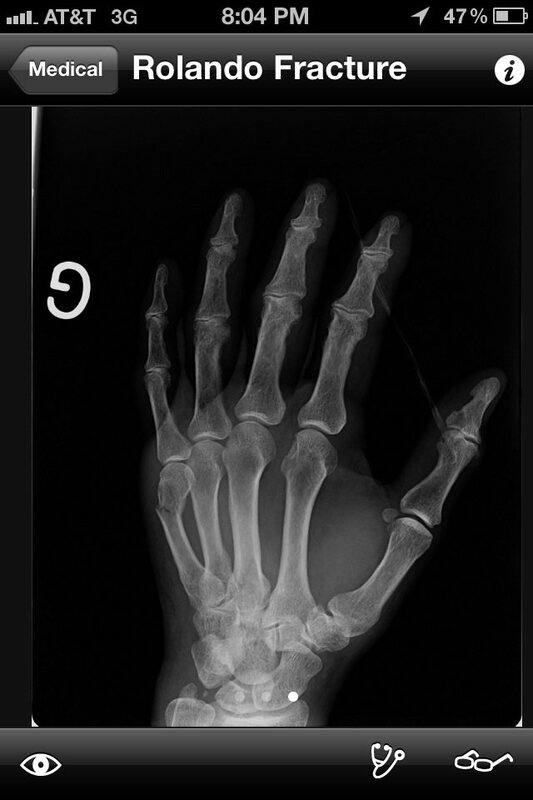 Furthermore, some of these diagnoses don’t actually exist on the films like in this case entitled “Rolando fracture” that is really an anticlimactic 5th metacarpal boxer’s fracture. Can you really do that? 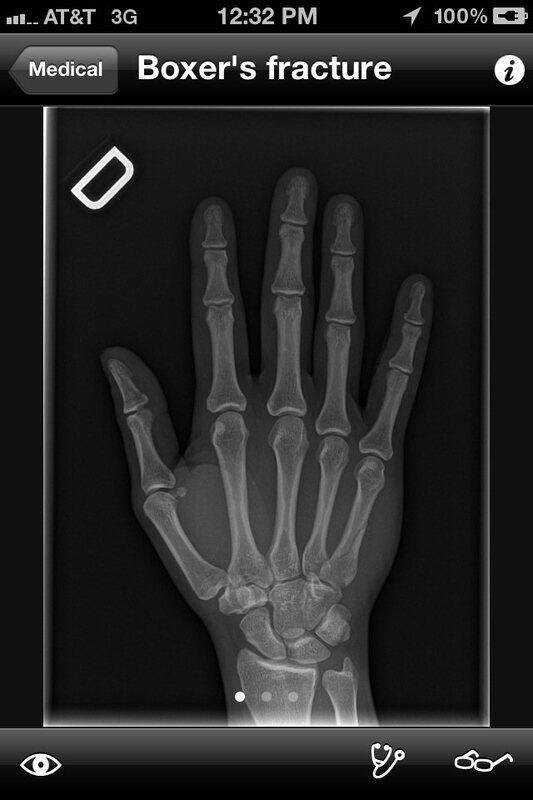 The funny thing is, the case actually entitled “Boxer’s fracture” is not even a boxer’s fracture, either. While that by itself would not be entirely strange, because you could imagine them including postoperative films on a percutaneous pinning of a distal radius or something, the case is actually a tension banding of a patella. Surprise! 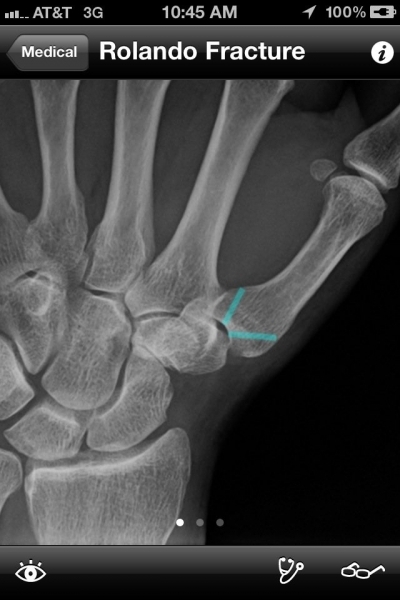 In general, if you click around in a certain section for a specific anatomic location, you might find a case that is relevant to what you are looking up, but it is too disorganized and incomplete to be useful as a quick reference.